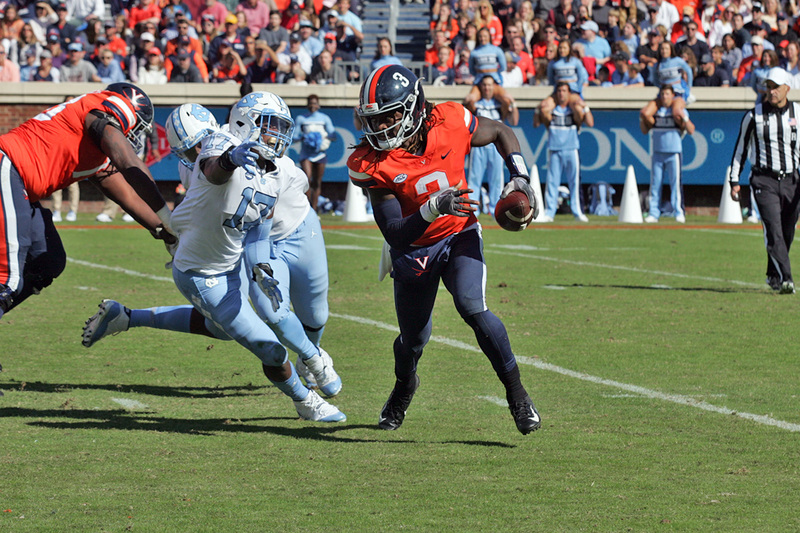 The Virginia football team enters November with bowl eligibility already in tow so the focus now shifts to whether UVA an add another postseason game to this year’s schedule too. That, of course, would mean the ACC Championship Game on the first day of December. The Cavaliers currently hold a one-game lead in the win column in the Coastal Division ahead of both Virginia Tech and Pittsburgh. Games against both of those teams remain on the schedule with contests against non-conference foe Liberty and Georgia Tech sandwiched in between. The first step in the quest for Charlotte comes in a Friday night showdown with Pitt at Scott Stadium. A win for the Hoos would guarantee that they’d head into a seven-day span in late November with a shot at the division title. Defeating the Panthers, however, has not been a regular occurrence in recent years. Since they joined the ACC in 2013, UVA owns just one win in five meetings. That includes an 0-3 mark against current Pitt coach Pat Narduzzi. In the past two years, one reason for the struggles has come on special teams. The Panthers have scored touchdowns on special teams for two straight years. In 2016, Quadree Henderson took a kickoff return 93 yards for a score. In 2017, he was at it again with a 75-yard punt return for a touchdown. The good news for the Hoos? Henderson is now in the NFL. The bad news? The Panthers continue to be dangerous in the return game. In fact, that’s just a big part of Pitt’s brand at this point. Since the 2000 season, the Panthers have 24 kick returns for touchdowns with 13 on kickoffs and 11 on punts. As impressive as that is overall, it’s been super-charged in the Narduzzi era with 12 of the 24 returns coming in his 3+ year tenure. Those 12 special teams return touchdowns are second nationally in that time span behind just San Diego State’s 13. Pitt is the only ACC team to return both a kickoff and a punt for a touchdown this season. Maurice Ffrench returned a 91-yarder against Albany in September and a 99-yarder at Notre Dame in October. Rafael Araujo-Lopes broke an 86-yard punt return for a score against Central Florida in September. In other words, the Cavaliers need to keep up their good work in the coverage categories this week. They have allowed just 2.8 yards per return on punts this season, good enough for seventh nationally. The Hoos sit 58th nationally in kickoff return defense by allowing 20.25 yards per return. If Brian Delaney can push all his kickoffs to touchbacks, it may make sense to stay risk averse this week on kickoff coverage. While Halloween passed by, it’s important for Virginia avoid any cravings for more candy in this matchup. Coach Mendenhall mentioned several times this week, that Pitt’s offense gives defenders a lot to look at each play. That includes multiple potential ball carriers, read option concepts, and more. Mendenhall said playing Pittsburgh is not exactly like playing the triple option, “but it’s just short of that in terms of preparation and the work that it takes to prepare for” the Panthers. Pitt gashed Duke lasts week for 484 rushing yards and four touchdowns in a 54-45 win. The offense averaged 9.3 yards per carry. That’s the second highest rushing total in program history, behind only a 530-yard outing against Army in 1975. That performance added to a growing list under Narduzzi. The Panthers have rushed for 200 or more yards 20 times in his tenure with a 15-5 record in those games, including a perfect 5-0 when rushing or 300+ yards. It will be important for UVA’s defenders to maintain eye discipline and execute their assignments this week. If anyone gets caught up chasing the wrong way or missing an angle with run fits, it could lead to a long day against this team. Part of the Hoos’ success this season has been shutting down the run and that certainly will be true again this week if they’re going to get a W.
The last two weeks, UVA had just one turnover combined against Duke and North Carolina. Entering the Pitt game, Virginia owns a +2 advantage in turnover margin on the season. One reason for that has been ball security. The Cavaliers have lost just four fumbles, good enough for a tie for 35th nationally. They’ve fumbled a total of nine times, which is tied for 37th nationally. On the flipside, Pittsburgh is one of the nation’s top teams at forcing fumbles. The Panthers are currently tied for eighth nationally with 12 forced fumbles this season. Cornerback Dane Jackson has knocked out three fumbles himself this season. They’ve recovered six of those. Defensive end Rashad Weaver is the leader there with three fumble recoveries this season for the defense. It’s been 37 years since a Pitt player recovered at least four fumbles in a season. Now, throw in the fact that Sabre weather contributor BadgerHoo forecasts that “a slug of moderate to heavy rain” may be passing through the region during the game. In other words, wet conditions could challenge players further to keep control of the ball. In a home game against a team that’s 0-3 on the road this season, it’s important for Virginia to hold on to the ball and not give the visitors any help as they try for an upset bid. Part of Virginia’s winning formula this season has been with an advantage in field position. The Cavaliers have owned an average starting field position (ASFP) edge in seven of eight games this season. The one exception came at Indiana where the teams were even with an ASFP of the 25-yard line for both teams. In UVA’s six wins this season, its ASFP has been its own 36.8-yard line and that bumps up to the 38-yard line during the current three-game winning streak. In the two losses, the ASFP dropped to the 26.5. When it comes to the game with Pitt, there are some categories where the Cavaliers might be able to take advantage and at least flip the field position if it doesn’t lead to scoring chances. The Panthers are ranked 117th nationally in third down conversion defense (46.9% conversions allowed), 99th in penalty yards per game (66.8), 107th in first downs per game for the offense (18.6), 70th in fumbles lost (6), and 102nd in net punting average (35.3 net average). Any of those categories could lead to field position flips if UVA is on top of its game. The Hoos rank 12th nationally in third down conversions (47.75%), eighth in penalty yards per game (38.9), and 15th (tie) for opponent first downs (16.4). They have punt return threats in Tavares Kelly (43-yard long return) and Chuck Davis (27-yard long return). If Virginia can’t rack up points like five of Pitt’s last seven opponents (those five teams scored 37 or more), it can still control the game with strong play and a field position edge. Last week, the North Carolina matchup had the potential of letdown game following two big wins. This week’s contest with Pittsburgh falls nowhere near that category. With both teams tied in the loss column in the ACC’s Coastal Division race, the national TV slot on ESPN2, and the featured space of a Friday night vs. a crowded Saturday slate, UVA and Pitt should be ready to go in this one. I find this matchup concerning. Teams like Pittsburgh with a run-focused identity and strong physical offensive lines as well as overall physical blocking have been able to challenge Virginia. Boston College and Pittsburgh last year pounded away at UVA. Navy in the bowl game. Indiana and NC State both had tough O-Lines earlier this year. Granted, this is a new team that held its own for large chunks of the IU and NCSU games and one that has been lights out against the run for the better part of this three-game winning streak, but it’s still at least a little worrisome. With that said, the Panthers haven’t had the defense to back it up for most of this season. Five opponents have lit up the scoreboard and Pitt has allowed an average of 34 points in its road games this season. The Hoos’ offense seems to be expanding in recent weeks vs. shrinking in the back half of the season like the last two years. A win here sends the Cavaliers into Tech week – they play Georgia Tech and Virginia Tech within seven days of each other – with a shot at the division title, though. I think that’s enough along with this being the last major home game of the year leading to a charged fanbase for the Hoos to win again. VIRGINIA 30, PITT 17. Season to date: 5-3. On paper, Pitt isn’t an overly impressive team. The running backs are very good, the offensive line is as well, and as always the Panthers have big play potential on special teams. Defensively, Pitt is vulnerable to the big play and has been average for the most part this season. If Virginia can perform well in all three phases as it has the past three weeks, this is a game it should win. I like the Hoos under the lights. VIRGINIA 35, PITT 20. Season to date: 5-3.